In fact, during the Victorian Era they were always looking to create new gadgetry to try to make life a little easier and create items that people simply couldn’t do without. If you look to the silver industry, all manner of things were being produced to pique people's interest. The item I am focusing on today is a neat little thing we have in our shop at the moment. It is called a chatelaine and was something I should imagine most Victorian ladies would have had on their wishlist. It was basically a kind of customised tool belt which a lady would attach at the waist and would dangle all the items she needed close to hand. Perhaps a nurse would have notebooks, pins, a thermometer maybe. Or a seamstress could have to hand her scissors a tape measure and a thimble. The possibilities were endless and you could continue to add to it as time went on. The chatelaine came about before the Swiss made their army knife in 1891, so you have to wonder where they got the idea. ‘La chatelaine’ is the title given to the female head of the grand country estates in France. The concept for the chatelaine was said to have been taken from the vast amount of keys these estate managers would carry about their person. Soon after the chatelaine was popularised it became more about the fashion than the practicality and every fashionable young thing would have desired one. 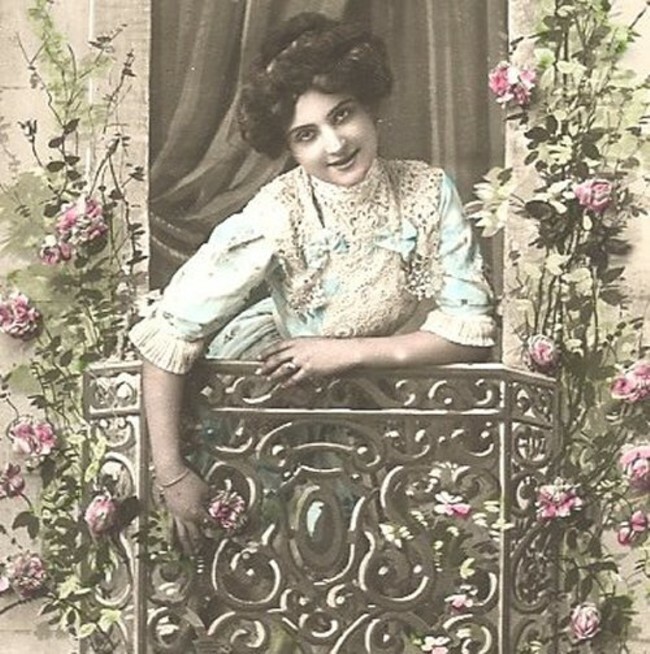 So be you and artist, wishing to carry your paint boxes and brushes, or a lady in mourning carrying about reminders of a loved one, a photo, a lock of hair, a chatelaine was a solution to a problem. The jangle of carrying these items would make a status giving racket too. A must-have item for every stylish gal about town. 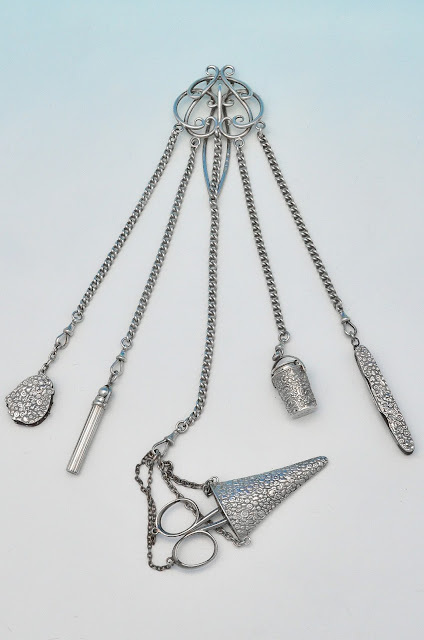 Here is the chatelaine to be found in our shop with its pen knife, thimbles, scissors, pin cushion and a dressmakers pencil. Ideal for the home seamstress.